This term, we are all super excited to be learning about 'The Ancient Greeks' and we are using this as our History focus! So far, we have looked at some of the main events that took place during these times and we began to order them. We have also looked at the Greek Theatres and the different features which supported them taking place. 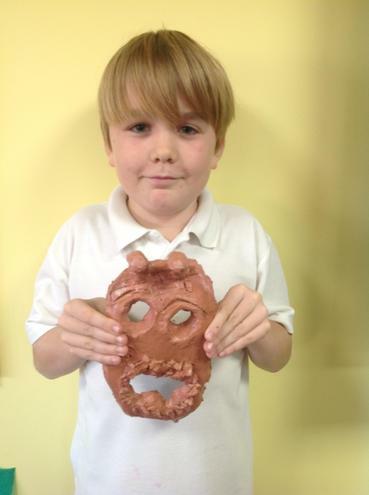 From this, we are currently researching and designing our own Greek Theatre masks. We can't wait to see the finished products at the end of the half term! Look how fabulously they have turned out! We have also linked our Ancient Greek topic into our Literacy focus. We are currently looking at Greek Myths and we are in the process of writing our own! To begin, we were acting out the famous myth ' Theseus and the Minotaur'! Ask us about the different grammar and punctuation we are striving to include in our final piece! In Science we are focusing on what happens to our food once it has been eaten. We have already named and located the different organs involved in the process and looked at the purposes of our teeth! We will continue to deepen our understanding of this through planned experiments.